United Kingdom (Conversation) – For weeks (and weeks) in the run up to Easter, brightly packaged chocolate eggs fill the shelves of British supermarkets. Piled high and sold cheap, they are easy to get hold of – even hard to avoid. But this wasn’t always the case. For almost a century after the first ones were produced in the 1870s by Fry’s and Cadbury’s, chocolate eggs were a luxury product. They were expensive, and difficult to find, with specialist confectioners often requiring orders to be made several months in advance. The ease of buying an Easter egg changed dramatically for British consumers in the middle of the 20th century, as they appeared in a wider range of retail outlets. Just a few years after the end of wartime rationing, Easter eggs were widely available in 246,400 outlets and thousands more co-operative shops. But even then, matching supply and demand was a real headache for both manufacturers and retailers. After Easter Sunday, remaining stock was difficult to sell, potentially wiping out profits. Shopkeepers did not want to over order because they had much less power over how much they could charge for sweet treats. Manufacturers were allowed to fix the prices of chocolate and confectionery until 1967 through Resale Price Maintenance legislation. If a shop wanted to discount Easter goods after the festival ended, they had to ask the permission of the manufacturer. 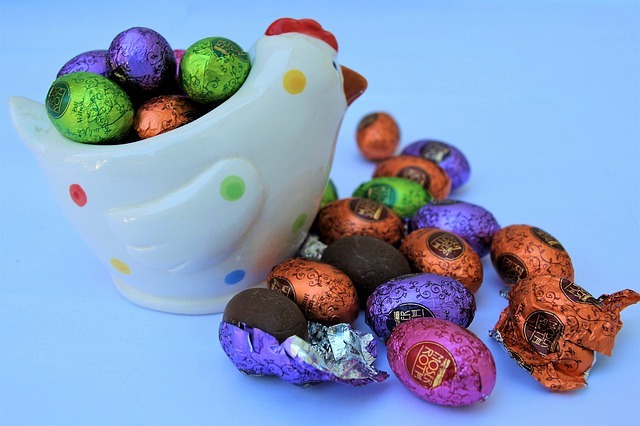 Although it sounds like manufacturers had it all their own way, confectionery producers made only slightly higher margins on Easter eggs compared to other chocolate goods – and eggs were much more difficult to make. Meanwhile, self-service was becoming the major innovation in post-war British retailing. The number of supermarkets grew from approximately 50 in 1950 to 572 by 1961, and by 1969 there were as many as 3,400. Self-service operations (including smaller stores and supermarkets) accounted for around 15% of grocery turnover in 1959, rising to as much as 64% ten years later. Specialist confectionery shops were worried by the trend – and rightly so. Then in 1967 the abolition of price fixing legislation led to Easter-themed goods becoming increasingly important in the supermarkets’ calendar. Ever since, they have offered cut-price chocolate eggs before Easter to attract shoppers into their stores. Competing for the deepest discounts and the largest sales, the pressure switched to manufacturers who had to meet demand, but risk over production. In the 1970s, supermarkets routinely cut the price of Easter eggs, meaning shoppers were shielded from some of the worst effects of inflation and soaring cocoa prices. Yet despite the difficult economic environment, in 1974, Grocer magazine reported that Cadbury’s aimed to significantly boost its share of the annual Easter egg business, which was worth around £23m. The following year, Cadbury’s hoped to gain 45% of the market with 21 items in its Easter range. Since the 1980s, manufacturers have invested heavily in technology and production abroad, in a bid to reduce their costs. And to meet supermarket demands for heavy discounts, they have reduced the variety of Easter eggs they produce. Consequently, the consumer price of chocolate eggs has remained broadly similar for the last 40 years or so. Taking into account retail price inflation, an egg costing two shillings in 1962 should be around £2.20 today, which isn’t too far from what we would expect to pay in most supermarkets for a chocolate egg in 2018 (despite the rising costs of cocoa over the past ten years). The Easter Bank Holiday is a time when shoppers spend money on groceries, which means that attracting people into stores is a particularly important objective for retail managers at this time of year. One way to do this is through big discounts on traditional chocolate treats. Nobody remembers resale price maintenance now, but we are left with the effects of this change in supermarkets up and down the country. The cut price Easter egg is now a major feature of our supermarkets – and is likely to stay. Changes in the law and the rise of self-service shopping have provided a huge boost to the total Easter chocolate trade. Worth an estimated £10m in 1960, it has jumped to around £364m today. The real losers from this were smaller sweet shops, who lost out as sales migrated to supermarkets. And although Easter eggs are big business, it is likely that we don’t value them as much today. There is less variety, less novelty and our way of buying them has changed. And this bountiful supply of cheap chocolate also means we are eating more of the stuff. By some measures Britons currently eat an average of 8.4kg of chocolate per year. That’s double the amount reported before 1967’s pricing rule change – and proves the confectionery industry is still on a roll. This report prepared by Adrian Bailey, Senior Lecturer in Management, University of Exeter for The Conversation.